Over the weekend I hosted some close friends who were visiting the city. Whenever I’m in their city(s) (they’ve lived in three within the last 2 years) they go above and beyond to accomodate me and make sure I have a great time. So when I hit them up and asked about what they wanted for dinner and they responded with, “Oooh!! Whatever is clever! I’d love to try a Yancey dish!” I knew it was time to pull out the big guns! There was no way I was gonna be piss poor and feed them bologna and cheese sandwiches with potato chips lol. While I have a recipe for a phenomenal black bean salsa dip (I triple the recipe so that there’s more to go around) that I swear by, it’s not the heartiest of meals. When trying to figure out what to pair it with, I remembered my Aunt Lynne’s suggestion awhile back. “Ashley, your bean dip is amazing! I have a recipe for a Southwestern soup that this dip would be PERFECT with!” After a quick text Aunt Lynne emailed me the recipe. My friends BASHED! They ate themselves into oblivion and kept remarking on how healthy, fulfilling and flavorful the entire meal was. If you want something quick (this soup was done in 10 min on the stovetop on high heat if you don’t count the time it took to cook the chicken), easy and different from the “same ol’ same ol'” that will yield leftovers, this is the meal for you! Mix and heat. You can make in a pot on the stove or in a crock pot on low…break up the refried beans if you can…I heated them first for a bit in the microwave before adding them to the crock pot. I also heated up some chopped zucchini and onions and added those as well. I left out the zucchini but did add diced red onions and tomatoes that were leftover from the bean dip I’d made. We sprinkled some cheese on top for garnishment and taste. You can easily make this a vegetarian dish by omiting the chicken. 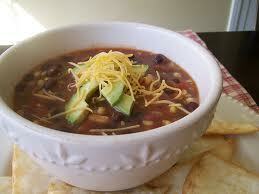 When I went to reheat it the next day (today), the consistency was close to chili…thick, hearty and full. « I Got the Hookup!